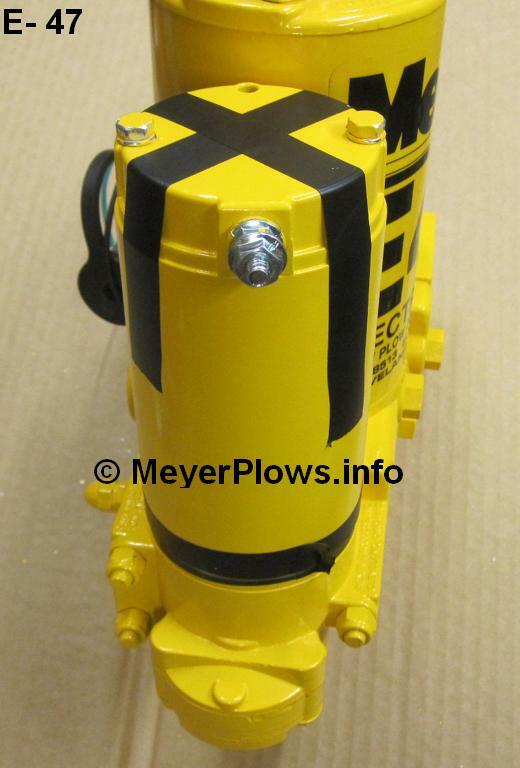 When installing a new Meyer E-47 motor, you need a way to keep it together after you remove the nuts from the screws. By crisscrossing electrical tape on the top, you can ensure that the top cap does not pop off. 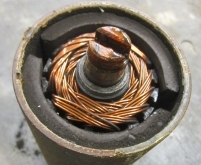 By wrapping electrical tape around the base of the motor, you can ensure that the bottom cap does not pop off. After you install the motor, you can remove the tape. 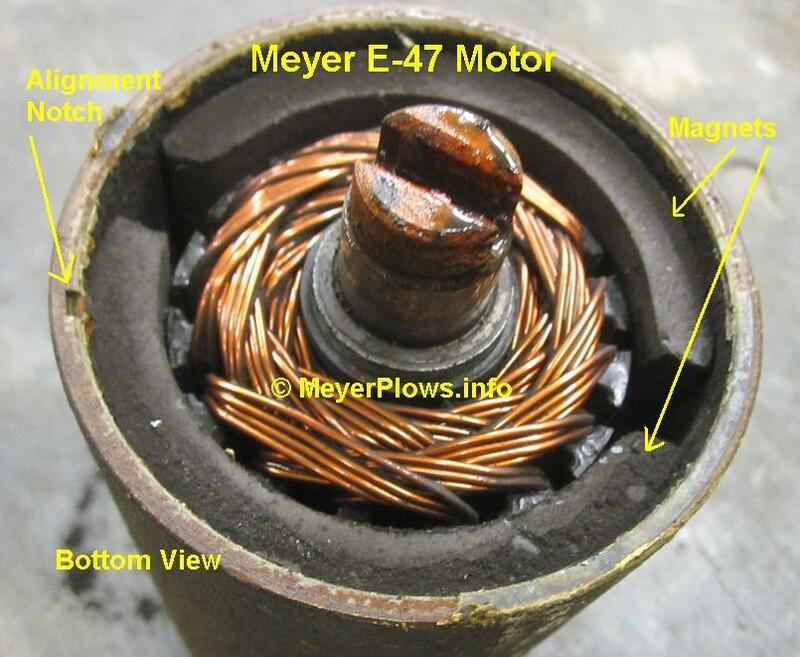 The same trick works when removing the motor from the E-47 assembly. Use tape to hold it together, then remove the two mounting screws. Always put an anti-seize compound on the threads of the screws to make it easier to remove them the next time. NOTE: Do not operate motor continuously for more than 30 seconds. NOTE: Do not operate motor continuously for more than 5 seconds. Seal screw heads with non-hardening gasket sealer such as Form-a-Gasket #2 per Meyer Service Bulletin No.72 below. 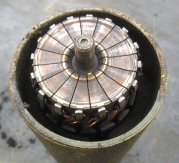 If you disassemble your motor for cleaning and inspection, remember that it is important to assemble it properly. There are notches in the top and bottom of the housing to ensure proper alignment of the top cap and end cap. More important than that, is making sure the body is in the right position. You can assemble it either way, but if you reverse the body, the motor will run backwards! Remember the magnets are closest to the bottom of the body when assembled properly. 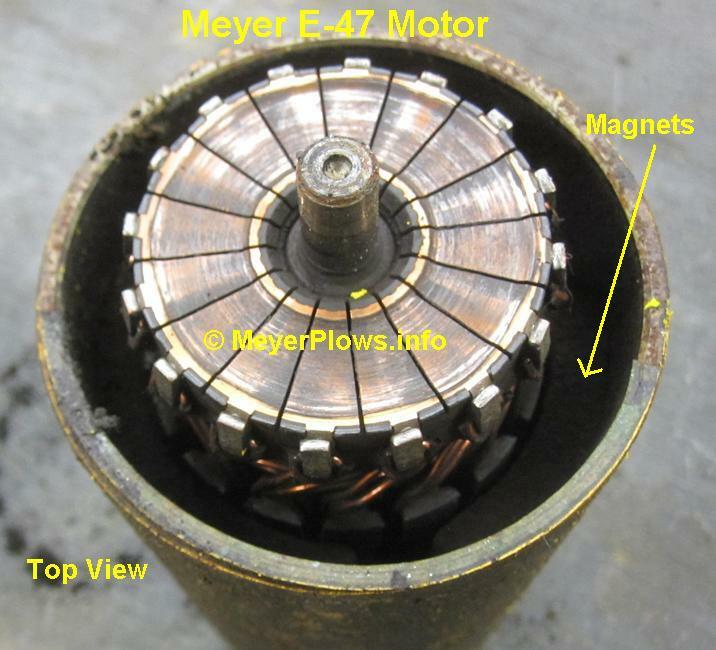 If you click on the above Meyer E-47 Motor pics, you can see how close the magnets are to the bottom end. 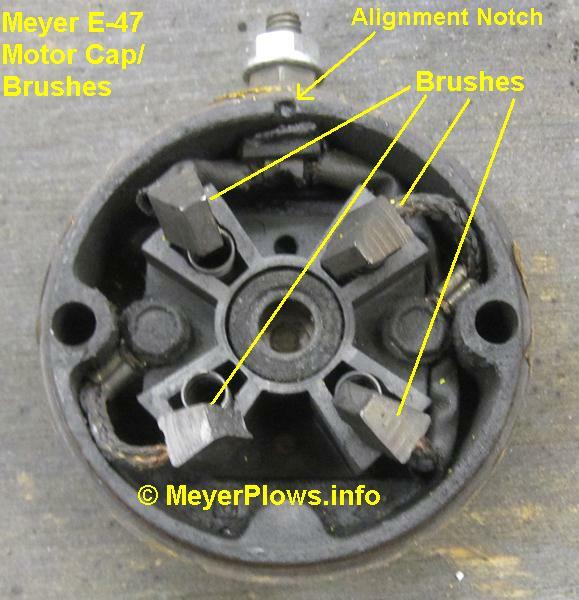 E-47 Motor Cap with Brushes. Includes new springs. For Bosch Type Motors. DOES NOT FIT PRESTOLITE MOTORS!